Book: No Establishment of Religion - John Witte, Jr. The First Amendment guarantee that "Congress shall make no law respecting an establishment of religion" rejected the millennium-old Western policy of supporting one form of Christianity in each nation and subjugating all other faiths. The exact meaning and application of this American innovation, however, has always proved elusive. Individual states found it difficult to remove traditional laws that controlled religious doctrine, liturgy, and church life, and that discriminated against unpopular religions. They found it even harder to decide more subtle legal questions that continue to divide Americans today: Did the constitution prohibit governmental support for religion altogether, or just preferential support for some religions over others? Did it require that government remove Sabbath, blasphemy, and oath-taking laws, or could they now be justified on other grounds? Did it mean the removal of religious texts, symbols, and ceremonies from public documents and government lands, or could a democratic government represent these in ever more inclusive ways? These twelve essays stake out strong and sometimes competing positions on what "no establishment of religion" meant to the American founders and to subsequent generations of Americans, and what it might mean today. ​Introduction – John Witte, Jr.
"This book, written by an impressive assortment of legal scholars with a wide range of views, … is a valuable resource for scholars, policymakers, lawyers, and judges who seek to understand how the principle of non-establishment of religion can be used not as a tool for marginalizing or privatizing religion, but as a means of fulfilling the promise of religious freedom and equality." ​"An excellent guide for anyone interested in exploring the constitutional aspects of American church history." "Readers of the Gunn and Witte collection will get superb, vigorous essays outlining two and a half centuries of interactions between American governments and denominations, religious movements, and individual believers . The essays are so wide-ranging and generally well done that the collection reflects the best scholarship on a subject still roiling modern American life and politics." "The editors of this sterling collection recruited an all-star lineup of contributors... Historians, legal scholars, political scientists, jurists, legislators, and an interested general public should all benefit from this book... superb." 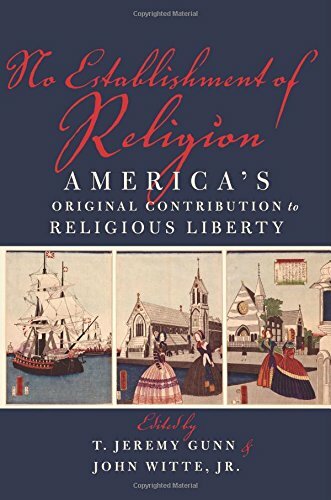 "As the outstanding and wide-ranging essays in this volume illustrate, Americans have often disagreed about the meaning and application of the Establishment Clause of the Constitution, and have sometimes confused it with an anti-religious or secularizing policy of marginalizing or privatizing religion. The project of securing the human right to religious liberty by disentangling political and religious authority is ongoing and-as national and world events remind us every day-pressing. This book offers both a helpful introduction to and an insightful debate about the history and future of this project."